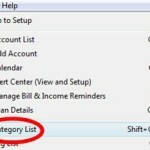 Below are three quick and powerful tips that will make Quicken 2010 Deluxe act more like Microsoft Money. While they don’t compensate for all the missing Money features, these tips will definitely make your transition to Quicken smoother. 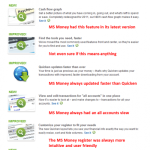 If you’ve used MS Money for years, one of the first quirks you’ll have when you open Quicken is looking at your account registers in a two-line view. While this may be great for an accountant who uses a manual ledger, I actually preferred the simpler one line view that Money had. The second line really serves no purpose, other than to take up screen space. 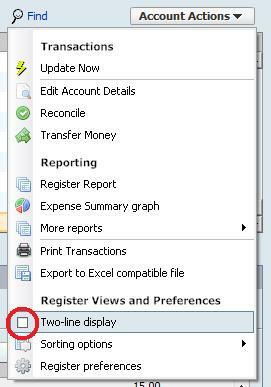 To change to a one line view, simply go into any one of your accounts, and look for the Account Actions drop down menu. Click it, then scroll down and uncheck the option for Two-line display. 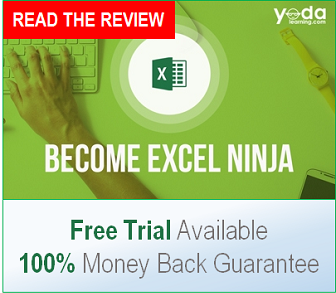 This is probably the most important adjustment in making Quicken more like Money. With the standard Money import handler, I had to confirm every transaction before it entered my ledger. While annoying at times, it forced me to confirm every credit card charge and has actually helped me spot a number of errors in my bill. This becomes even more important with Quicken, as the standard financial data import goes straight into your accounts, no confirmation needed. If you have an offline transaction that, for some reason, isn’t matched to the same transaction from an online source, Quicken will simply duplicate the transaction. If you happen to be doing a massive account update, this can be a real pain, as distinguishing between entered and downloaded transactions is not intuitive in Quicken. 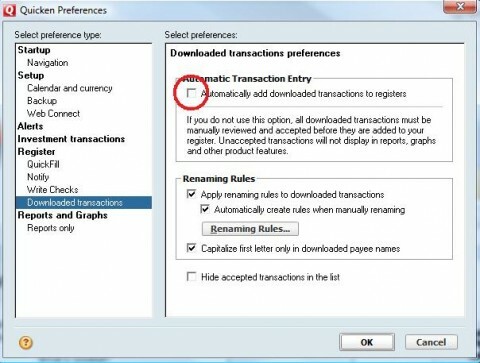 To change to manual confirmation of downloaded transactions, click on the Edit menu at the very top of the program and scroll down to Preferences. Then Click Quicken Preferences. This is a small gripe, but the standard view of your accounts rounds the overall values to whole dollars. This is strange considering this software was built by accountants and bean counters. The whole point I have financial management software is to tie my accounts to the penny. Anyone who’s worked in accounting knows that even an error of a few cents, if left uncorrected, can lead to hours of backtracking and rework. Keep the tips coming! I’m still working on my switch, which is taking months to complete. I’m running them in parallel until I can confidently turn off MS Money. Sure thing Madison. I actually had a couple more notes about my switch from Money to Quicken in draft status, but have neglected to finalize them as I got caught up with studying for business school. I’ll post them up soon. I’m on a slightly different track. How do I show cents in MS Money? Have just started working with the Sunset edition of MS Money. Interface won’t allow me to enter cents, won’t show cents. Oddly enough, this happens only for accounts in the base currency. Frustrating. Found your post in searching for solution. I’ve already removed MS Money from my computer, so I can’t check by myself. 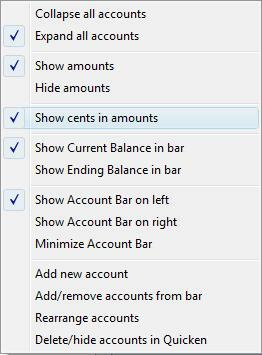 But I’m sure I could always view MS Money with cents showing, as I think it was the default setting. Do you have the US version? If so, I think it may be possible that in your initial account setup, you may have tweaked something to make the account not show cents. Is your base currency is “0.00” or just “0”? Hope that helps. Thanks. I miss MS Money. Thanks for making the transition easier. I came from MS money and hate Quicken so far. When I download my cc statement, I select the statement instead of all transactons, but it still downloads my current balance past the date I selected, I can never get the balance to show zero and balanced like MS Money. What am I doing wrong?